Biography of American Romantic Expressionist Landscape Painter. (1895-1910) Cleveland Museum of Art. Despite being one of the least understood of modern artists, the reclusive self-taught New York painter Albert Pinkham Ryder was an important contributor to American art at the turn of the century. His imaginative Romanticism was expressed in themes taken from opera, literature, poetry, legend and the Bible, while his somber 19th century colour palette, simple composition and solitary, twisted figures created a unique Gothic-style world of landscapes and moonlit seascapes. He was a slow worker, with a lifetime output of about 150 pictures, who specialized mostly in landscape painting - marked by thick layers of colour pigments, and a yellow twilight or moonlight - and mystical allegorical works. Famous examples of Ryder's oil painting include: The Race Track (Death on a Pale Horse) (1895-1910, Cleveland Museum of Art), Toilers of the Sea (1880-5, Metropolitan Museum of Art, New York), Siegfried and the Rhine Maidens (1888-91, National Gallery of Art, Washington DC) and The Flying Dutchman (1896, National Gallery of Art, Washington DC). Many of his works reflect his view of the power of nature, as well as his obsession with the sea. He spent much of his life as something of a solitary, misanthropic dreamer, and died in impoverished isolation. His reputation waxed during the 1950s and 1960s, due to the impact of Abstract Expressionism. Due to poor eyesight, Ryder left school early and received no formal training in art. His first pictures, small landscapes, were painted out-of-doors in the 1860s in and around his native town, the thriving Massachusetts whaling port of New Bedford, which gave him plenty of opportunity to practise his plein air painting of landscapes and coastal scenes. In 1870 he moved to New York City to live in a hotel run by his brother. At the same time he applied to study at the National Academy of Design, but was rejected. Instead, he managed to obtain informal classes with William E. Marshall, a New York portrait painter. In addition, he enrolled in part-time classes, at the National Academy, in drawing from life and from antique statues. He also studied the art of engraving and the pastoral scenes of the Barbizon school of landscape painting. Ryder began to develop an intensely personal style of painting, characterized by a naive simplicity and an individual sense of form and colour. In 1873, he exhibited several paintings at the National Academy and met Daniel Cottier, who became his agent and secured him commissions for decorative artwork on mirrors and screens. In 1878, he joined the Society of American Artists, a progressive organization that placed far less importance on the prevailing style of academic art propounded by the National Academy. In 1877, at the urging of Cottier, Ryder visited England for four weeks, staying in London. Later, in 1882, he went on a Grand Tour of Europe accompanied by Cottier and the sculptor Olin Warner, but studying the works of Old Masters held little interest for him. Indeed, J. Alden Weir, a close friend of Ryder, noted that the artist's best memories of the trip were of crossing the Alps and returning home! Nonetheless, he returned to Europe in 1887 and 1896, sailing with a friend, Captain John Robinson, who remembered how Ryder spent most of the night and day - on deck, so that he could watch the sea and the sky. About 1880, Ryder began to turn away from pastoral subjects to themes inspired by mythology, literature, the bible, and the operas of Richard Wagner. His composition Siegfried and the Rhine Maidens (1888-91, National Gallery of Art, Washington DC) was painted after a New York performance of Wagner's Gotterdammerung, while The Temple of the Mind (c.1885, Metropolitan Museum, New York) was based on the poem "The Haunted Palace" taken from "The Fall of the House of Usher" (1840), a story by Edgar Allen Poe. 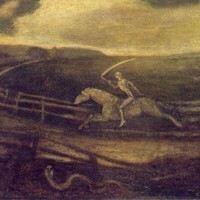 His masterpiece The Race Track, also called Death on a Pale Horse (1895-1910, Cleveland Museum of Art) features an eerie skeletal figure - death - riding a horse while brandishing a scythe. His horse is running the wrong way along a barren and bleak racetrack which stretches all the way to the horizon. The landscape and sky are painted in muted muddy colours. The work was inspired, supposedly, by the tale of a man who gambled everything he owned on a horse race. His horse lost and as a result he committed suicide. Ryder's track, therefore, probably represents life, a simple course that emerges from and returns to the murky "Beyond". Death rides along the road with macabre glee. Overall, the work illustrates the brevity of human existence, and depicts greed for money as a fruitless and doomed pursuit. After his father passed away in 1900, Ryder's artistic output declined and he became even more reclusive. Despite this, his reputation as an artist grew, and he was invited to exhibit six paintings in the influential Armory Show (1913), New York, where his work was acclaimed as an important precursor of modernism in its tendency towards abstract art - an aspect which so impressed the famous Abstract Expressionist Jackson Pollock (1912-56), thirty years later. Sadly, the misanthropic Ryder was a poor housekeeper and money manager. His home was dirty and he slept on a piece of carpet that was rolled up during the day. He ended his days as an impoverished recluse, cared for by one or two loyal friends. Ryder's mature painting was a type of Romantic Expressionism - a rare combination, practised only by artists in Germany, and by the exceptional JMW Turner (1775-1851). He adhered to this intensely personal style for most of his mature life, showing no interest in highly fashionable styles like Impressionism - see, for instance, George Inness (1825-1894), Whistler (18341903), Mary Cassatt (1844-1926) or Childe Hassam (1859-1935) - or Realism - see, for instance, Winslow Homer (1836-1910) and Robert Henri (1865-1929). During the mid-1950s, Ryder became recognized as an important precursor of Abstract Expressionism and one of the most innovative 20th century painters. Paintings by Albert Pinkham Ryder can be seen in many of the best art museums throughout the world.  For biographies of other American artists, see: Famous Painters.  For more details of early 20th century painting in America, see: Homepage.